Escaped Exotics, a series of field guides and videos that identify four invasive plant species to uncover strains of ecological connectivity in everyday public spaces. Of the hundreds of non-native plants that populate the heavily altered Miami bioregion, those species deemed most invasive emerge as indicators for unraveling patterns in the ways landscapes are shaped by human desires and vice versa. Escaped Exotics posters and videos profile four species whose adaptive features enabled them to dominate region in excesses disruptive of native ecology once they were introduced by humans. 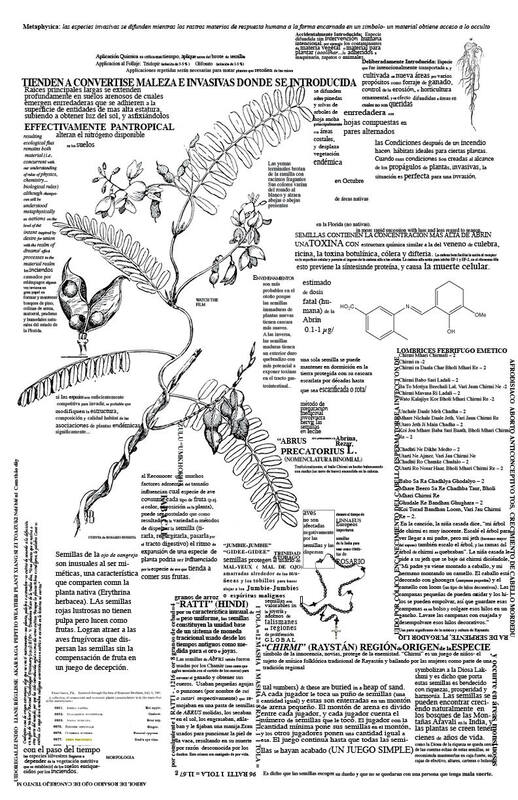 Short videos and field guides (in poster form) present species local introduction histories, functional adaptations, ecological effects, and pantropical ethnobotanical contexts. 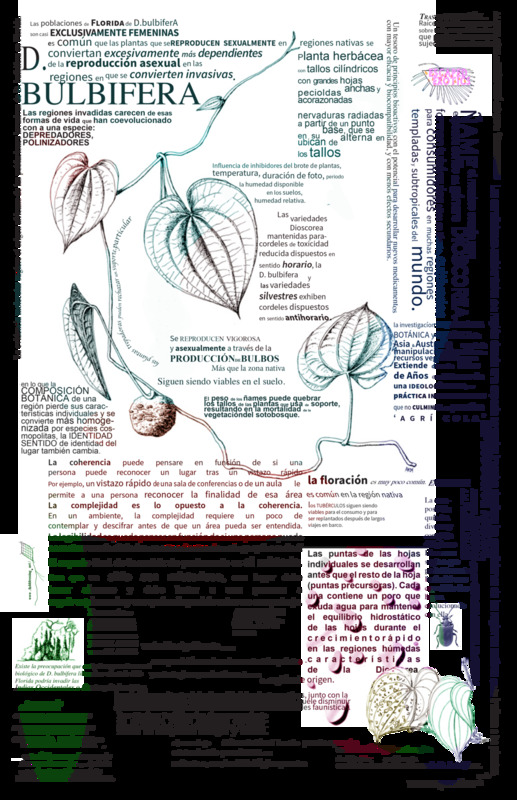 Field guides combine text and image into posters translated into English, Spanish, and Haitian Creole versions and distributed throughout metro Miami. Posters are continuously applied to building surfaces in highly trafficked areas and/or nearby living examples of the plants themselves using a biodegradable/removable technique of application (wheatpasting) and in popup distributions. Video coverage provides windows to locations of species and illustrates adaptive traits and solicits resident submissions for installation locations. text is transposed and adaptive from emergent research, moderated history, and field studies. All texts have been proofread by EVERGLADES NATIONAL PARK official biologists. translations into Spanish and Haitian Creole by a company of professional translators and translation services including trusted translations, MJ Fievre, Rosario Vidales, and Creoletrans . IS CONTENT APPROPRIATE FOR GENERAL AUDIENCES? Escaped Exotics text is focused on biology, history, theory, and applications of invasive plant ecology. Escaped Exotics includes no obscene or off-topic content. HOW LONG WILL POSTERS BE UP? Posters will be applied in a level and aesthetic position within a month after permission is granted. Hosting period must last longer than 3 months . Removal requests will be accommodated within 3 weeks following request for removals. If no requests for removal are made, posters may remain until natural processes of disintegration occur since all materials are natural and biodegrable. WHAT ARE THE BENEFITS OF HOSTING ESCAPED EXOTICS FIELD GUIDES? empower passerby with new understandings of familiar landscape features.